Cholesterol is one of the fats present in the body. It is essential for life, and is found in all human and animal tissues. It is carried around the body by the blood. Some cholesterol comes directly from food, and some is made by the liver. High blood cholesterol is usually due to eating too much fat. It can also be caused by not getting enough exercise. Occasionally, high cholesterol runs in the family, and in these circumstances it is due to the body not coping well with normal amounts of cholesterol being eaten. Why Are High Levels Of Cholesterol A Problem? High blood cholesterol can cause health problems. The most important of these is heart disease, including heart attacks. 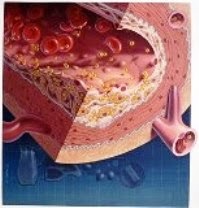 High cholesterol levels cause fatty deposits to build up inside blood vessels. Eventually the vessels can block and blood cannot flow through them. This is particularly likely to happen in the narrow vessels which supply blood to the muscle of the heart (the coronary arteries). This may cause damage to the heart and can cause a heart attack. If you have high blood cholesterol, whatever the cause, it is possible to do something about it and so reduce your risk of developing heart disease. What else causes heart disease? High blood cholesterol is only one of several things which can lead to heart disease. Other things include smoking, high blood pressure, stress and lack of exercise. These are called 'risk' factors because they increase the risk of heart disease. The more risk factors you have, the more likely you are to develop heart disease. To reduce your risk of heart disease, it is important to identify and control as many of your risk factors as possible. High blood cholesterol is only one of the risk factors to consider. Your doctor will be able to assess and advise you on all your risk factors. Your doctor or nurse will take a blood sample to measure your cholesterol level. Measurements can vary slightly, so it may be necessary to take more than one sample to be certain of the real level. Your doctor might also want to measure the levels of different types of cholesterol in the blood. These are HDL (high-density lipoprotein) cholesterol and LDL (low-density lipoprotein) cholesterol. They affect how likely it is that a high cholesterol level will lead to heart disease. Knowing about these will help your doctor to assess your risk of heart disease. High Cholesterol Levels - What Can Be Done? There are three main ways of reducing cholesterol levels: 1. to change what you eat; 2. increase the amount of exercise you take; and 3. take medication. For most people, the doctor will recommend trying the first two approaches. This is often enough to get levels down to normal. If this doesn't work, your doctor may prescribe a tablet. You are more likely to need medication if your cholesterol level is very high, if you have a lot of other risk factors, or if you have already had a heart attack. Changing what you eat can lower your cholesterol level. The main aim is to cut down the amount of fat you eat. However, the type of fat you eat is also important. Saturated fats (such as butter) tend to raise cholesterol. Cutting down saturated fats can lower your blood cholesterol by 20 per cent. Changes in your eating habits have to be long-term to be effective. So you need to find a healthier eating pattern which you are happy with and can stick to. You can still enjoy your favourite food in moderation, and you don't have to feel guilty about indulging yourself now and then. Regular exercise can reduce cholesterol and so the risk of heart disease. Exercise also helps other risk factors for heart disease, including high blood pressure, stress and being overweight. The best activity is one that you enjoy. It does not have to be particularly strenuous. Walking, swimming, cycling and gentle jogging are all effective. * Have not been physically active recently. Medication can be an effective way of lowering very high cholesterol levels. If you need medication, it usually needs to be taken long term. Your doctor will tell you whether or not you should consider taking medication. • Use unsaturated margarine instead of butter. By Dr Scott Lennox, MB, ChB, MRCG, published by Dr Vivienne Balonwu.